Deciphering the mechanisms that control the osteogenic differentiation of mesenchymal stem cells (MSCs) may provide a means to improve therapies employed to treat and/or prevent several common bone disorders. Studies have demonstrated the deposition of trimethylation of histone H3 on lysine 4 (H3K4me3), considered a permissive chromatin modification, at the promoter sequences of several important osteogenic genes during MSC differentiation [1-3]. The Absent, small, or homeotic disc1 like (Ash1l) Trithorax family member can activate gene expression through inherent H3K4 methyltransferase activity, and several studies have linked this enzyme to the regulation of bone formation. These include reports of Ash1l mutant mice displaying reduced growth  and of the reduction of Ash1l levels in rheumatoid arthritis (RA) model mice leading to more severe cartilage and bone destruction . Now, a STEM CELLS study from the lab of Ling Ye (Sichuan University, Chengdu, Sichuan, China) delineates the epigenetic control of bone formation through Ash1l with the hope that the discovery of this regulatory mechanism will aid in the development of new and improved therapies for common bone disorders . Initial analyses of osteoporotic mouse bones revealed low Ash1l expression (both mRNA and protein) and low levels of the H3K4me3 permissive histone modification when compared to healthy bone, therefore suggesting a positive correlation between Ash1l expression levels, H3K4me3 levels, and bone mass. To explore the relevance of Ash1l in bone formation, Yin et al. employed gene silencing and overexpression studies in mouse MSCs. The authors established that while Ash1l silencing inhibited osteogenic and chondrogenic differentiation but stimulated adipogenesis in MSCs, the overexpression of only those Ash1l proteins with histone methyltransferase activity enhanced osteogenic and chondrogenic differentiation while inhibiting adipogenic differentiation. 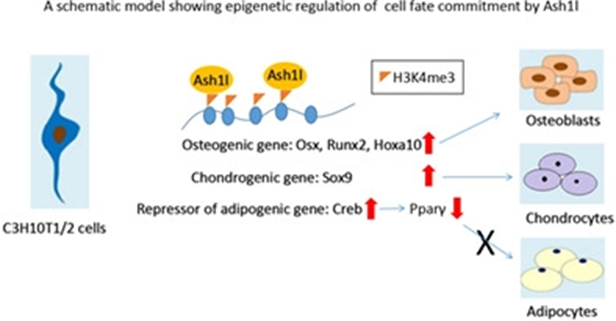 Mechanistically, the authors demonstrated that Ash1l bound to the promoters of crucial osteogenic and chondrogenic transcription factors (e.g., Osx, Runx2, Hoxa10, and Sox9) and adipogenic repressors (e.g., Creb) in MSCs where it deposits of H3K4me3, thereby promoting gene expression via the establishment of a permissive chromatin landscape. Overall, the authors highlight the importance of Ash1l-mediated epigenetic control of bone formation and highlight Ash1l as a target for therapeutic strategies to promote osteogenesis. For more on the epigenetic regulation of mesenchymal stem cells and novel therapeutic approaches for bone disorders, stay tuned to the Stem Cells Portal! Jin Y, Elalaf H, Watanabe M, et al., Mutant IDH1 Dysregulates the Differentiation of Mesenchymal Stem Cells in Association with Gene-Specific Histone Modifications to Cartilage- and Bone-Related Genes. PLoS One 2015;10:e0131998. Hakelien AM, Bryne JC, Harstad KG, et al., The regulatory landscape of osteogenic differentiation. STEM CELLS 2014;32:2780-93. Zhang YX, Sun HL, Liang H, et al., Dynamic and distinct histone modifications of osteogenic genes during osteogenic differentiation. Journal of Biochemistry 2015;158:445-57. Brinkmeier ML, Geister KA, Jones M, et al., The Histone Methyltransferase Gene Absent, Small, or Homeotic Discs-1 Like Is Required for Normal Hox Gene Expression and Fertility in Mice. Biology of Reproduction 2015;93:121. Xia M, Liu J, Wu X, et al., Histone methyltransferase Ash1l suppresses interleukin-6 production and inflammatory autoimmune diseases by inducing the ubiquitin-editing enzyme A20. Immunity 2013;39:470-81. Yin B, Yu F, Wang C, et al., Epigenetic Control of Mesenchymal Stem Cell Fate Decision via Histone Methyltransferase Ash1l. STEM CELLS 2019;37:115-127.